"I'll meet you back at the hotel" Acrylic & spray paint on found/vintage painting/frame. 23"x37"
"Nothing personal, I just don't like you" Acrylic & spray paint on found/vintage painting/frame. "I can see the future in the rear view mirror" Acrylic & spray paint on found/vintage painting/frame. 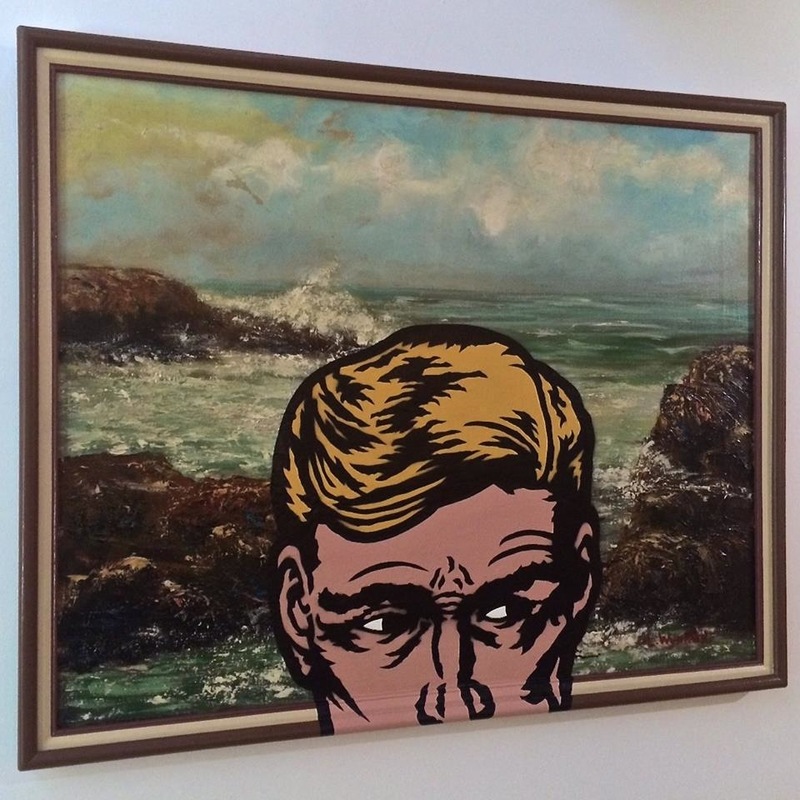 17"x21"
"Last I heard he was in Cape Cod" Acrylic & spray paint on found/vintage painting/frame. 50"x25"
"She skipped town & sent me a postcard" Acrylic & spray paint on found/vintage painting/frame. "He only likes David Lee Roth Van Halen" (Ray Vannetta) Acrylic & spray paint on found/vintage painting/frame. "Can we go inside now?" Acrylic & spray paint on found/vintage painting/frame, 20"x26"
"She went from unbelievable to believable real fast" Acrylic & spray paint on found/vintage painting/frame. "Dinner for one" Acrylic & spray paint on found/vintage painting/frame. 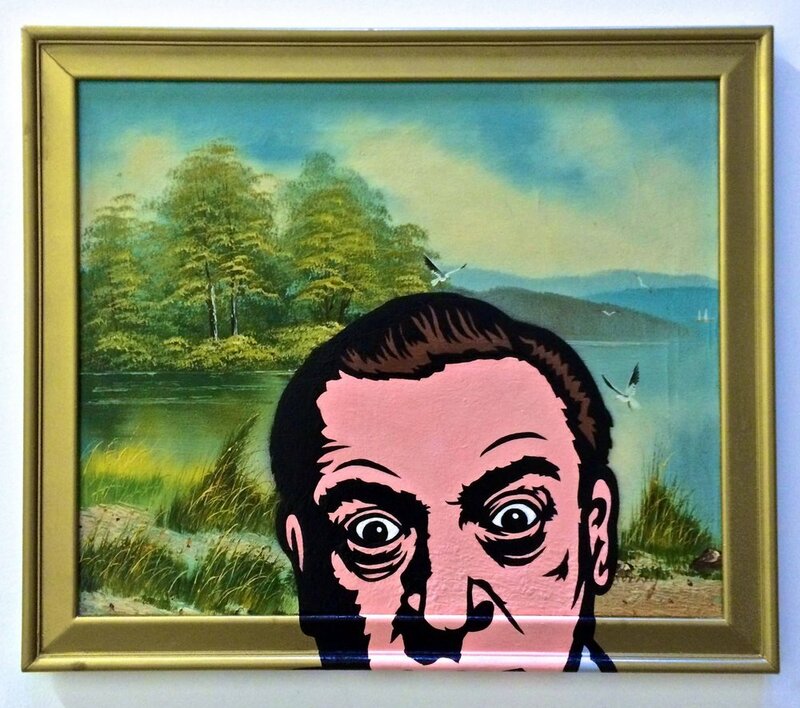 "Nature Boy" Acrylic & spray paint on found/vintage painting/frame. "Happiness is easy when you're not very smart" Acrylic & spray paint on found/vintage painting/frame. "Do your demons ever let you go?" (Ronnie James Dio) Acrylic & spray paint on found/vintage painting/frame. 24"x52"
"This is how it all ends" Acrylic & spray paint on found/vintage painting/frame. Acrylic & spray paint on found/vintage painting/frame. "It's even worse than I remembered!" Acrylic & spray paint on found/vintage painting/frame. 18"x22"
"Did you think I'd just forget?" Acrylic & spray paint on found/vintage painting/frame. 22"x44"
"Things didn't go as planned" Acrylic & spray paint on found/vintage painting/frame, 29"x35"
"Your opinions don't matter here" Acrylic & spray paint on found/vintage painting/frame. 23"x23"
"Never mind the dog, beware of owner" Acrylic & spray paint on found/vintage painting/frame. 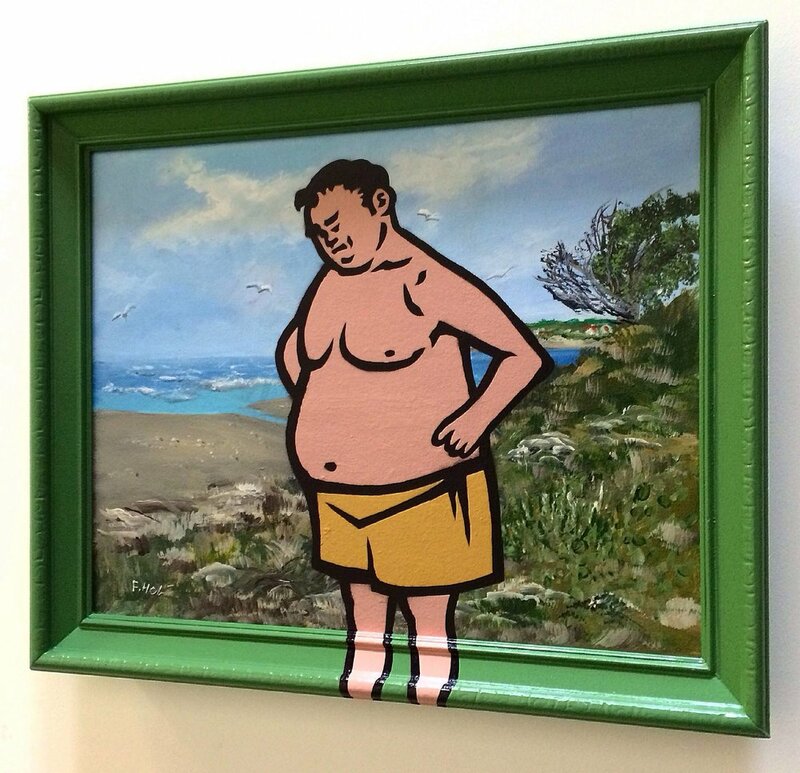 23"x39"
"Summer vacation, 1961" Acrylic & spray paint on found/vintage painting/frame. 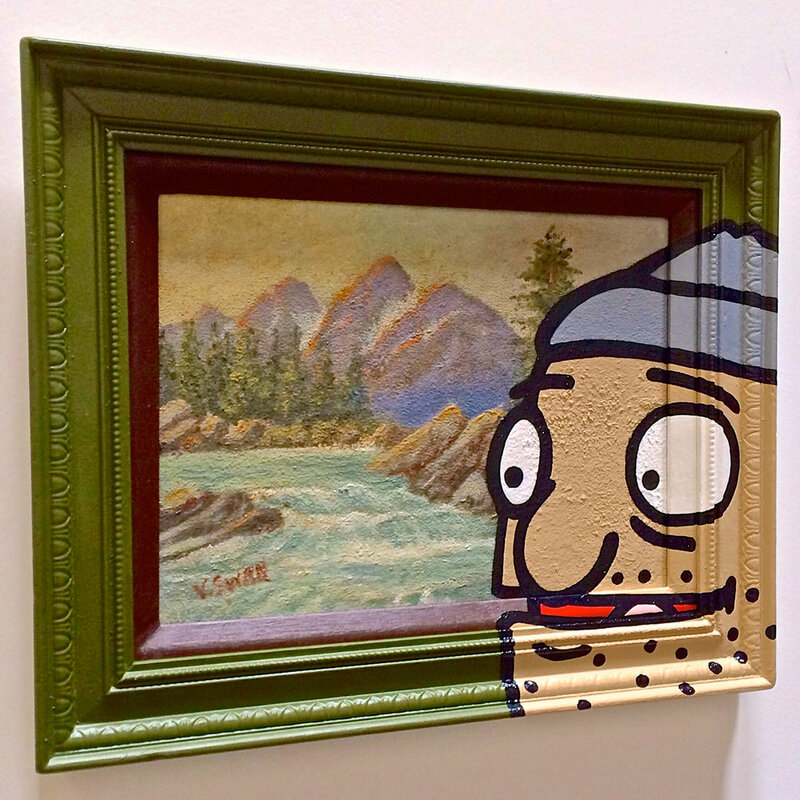 "One trick pony" Acrylic & spray paint on found/vintage painting/frame. "Smite thee" Acrylic & spray paint on found/vintage painting/frame, 34"x28"
"New tricks" Acrylic & spray paint on found/vintage painting/frame. "You have no choice in the matter" Acrylic & spray paint on found/vintage painting/frame. 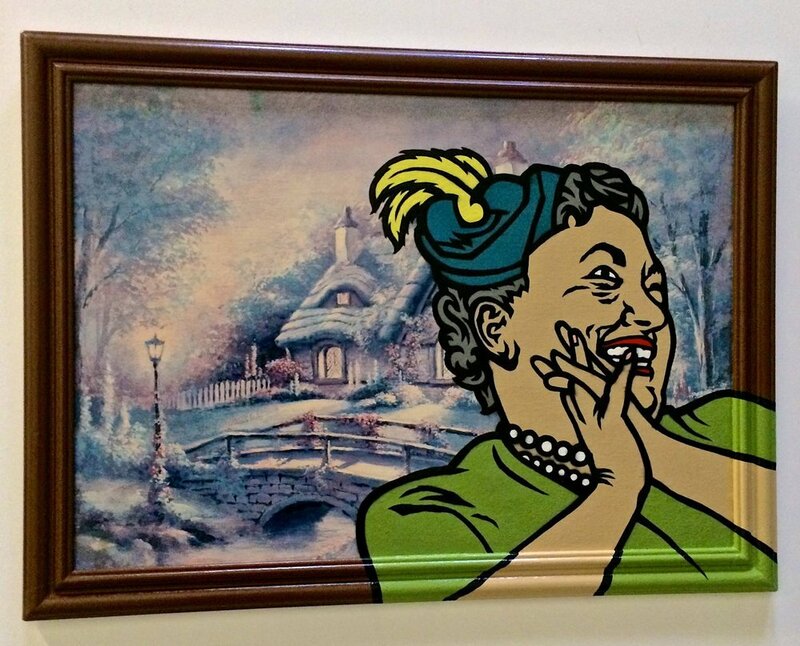 "Took 'ya long enough" Acrylic & spray paint on found/vintage painting/frame. "Jazz Hater" Acrylic & spray paint on found/vintage painting/frame, 22"x18"
"Candyland" (John Candy) Acrylic & spray paint on found/vintage painting/frame. "At war with nature" Acrylic & spray paint on found/vintage painting/frame. "Nothings changed, except that you're older" Acrylic & spray paint on found/vintage painting/frame. 27"x35"
"If she's happy, I'm happy" Acrylic & spray paint on found/vintage painting/frame. 23"x32"
"I pay the bills, but I pay them late" Acrylic & spray paint on found/vintage painting/frame. 19"x23"
"Finish one to start another" Acrylic & spray paint on found/vintage painting/frame, 19"x31"
"What's so great about this place?" Acrylic & spray paint on found/vintage painting/frame. "Someday she'll thank me for this" Acrylic & spray paint on found/vintage painting/frame, 24"x30"
"Milk" Acrylic & spray paint on found/vintage painting/frame. 14"x17" round. "Virginia" Acrylic & spray paint on found/vintage painting/frame, 14"x15"
"Mother nature in law" Acrylic & spray paint on found/vintage painting/frame. 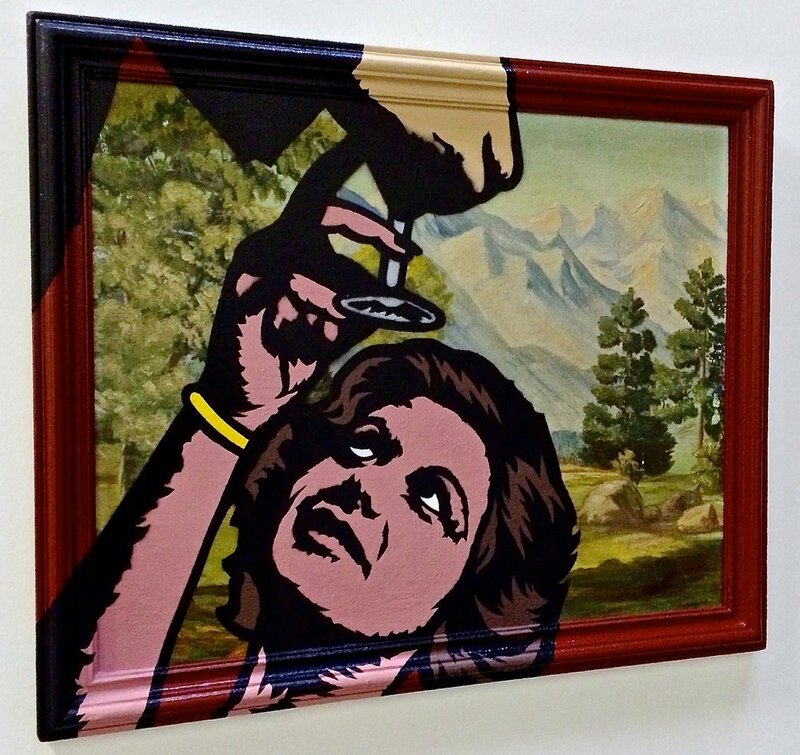 24"x28"
Keep your travel stories to a minimum" Acrylic & spray paint on found/vintage painting/frame. 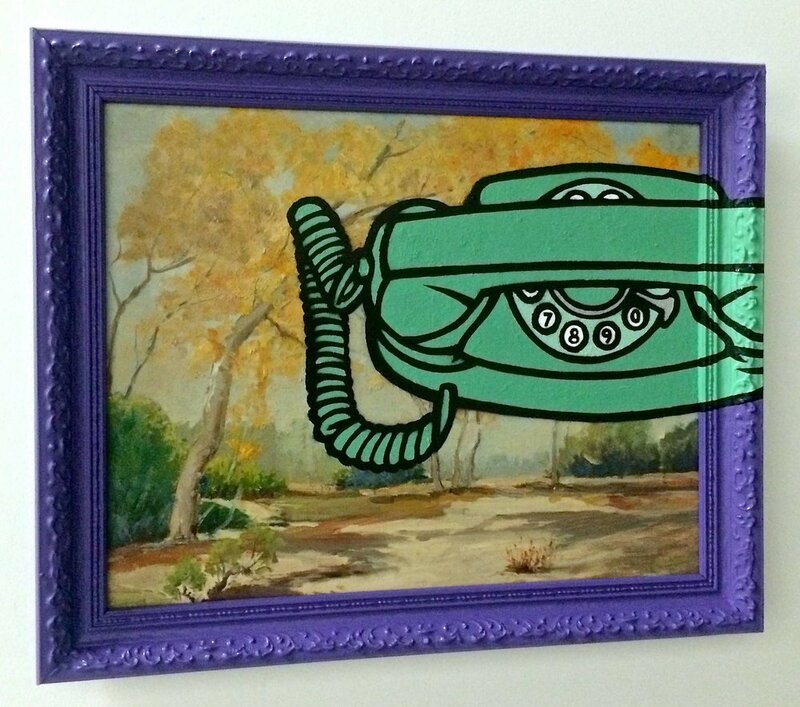 "Call me when you get there" Acrylic & spray paint on found/vintage painting/frame. 19"x23"
"Every bad decision I made led to this" Acrylic & spray paint on found/vintage painting/frame. 17"x21"
"One drink led to nine" Acrylic & spray paint on found/vintage painting/frame. 19"x23"